Six hospitals across Israel on Monday received activists and soldiers who were injured in the takeover of the aid convoy making its way to the Gaza Strip. In total, 42 people, including eight soldiers, were injured in the incident. Eleven of the injured were in serious condition, including two soldiers. One by one, choppers carrying the injured landed on helipads at the various hospitals. Ten people were evacuated to the Chaim Sheba Medical Center in Tel Hashomer, including four activists and an IDF soldier who sustained serious wounds, a soldier in moderate condition, and three activists and a soldier in light condition. During the day, rumors circulated that Sheikh Raed Salah, head of the Islamic Movement's northern branch, was seriously injured in the raid and evacuated to the Chaim Sheba Medical Center. The rumors were refuted, and he was found on one of the ships, injured, but not in serious condition. Salah's relatives rushed to the hospital, where they faced off with the family of a soldier who was injured in the raid. Only police intervention, with the help of the hospital's Director-General Zeev Rotstein, was able to subdue the tension. Sheba Deputy Director Arnos Ofek said the hospital has received calls from various embassies, including those of Italy, turkey and Greece, asking whether citizens of their countries were among those injured. He said that due to failure to identify the injured, it was impossible to obtain information of their country of origin. Fourteen people were evacuated to Beilinson Medical Center in Petah Tikva – all activists from the aid ships. Four of them arrived in serious condition, and 10 sustained light to moderate injuries. Hadassah Medical Center treated four civilians, all in moderate condition, and two soldiers in light condition were evacuated to Sourasky Medical Center in Tel Aviv. Three more activists who sustained light wounds were taken to Barzilai Medical Center in Ashkelon for treatment. Eight people were initially taken to Rambam Medical Center in Haifa, including two soldiers, in light and moderate condition, and six activists all in moderate and serious condition. Later Monday Another soldier injured in the raid arrived at Rambam for treatment. The soldier initially returned to his base with one of the ships, and was then found to have sustained fractures in his skull. The soldier was hospitalized in light condition. Rambam received its first patient, a soldier who was stabbed in the abdomen, at around 6:45 am. After initial tests, the soldier was transferred to the operating room. The hospital said he was in moderate condition and was recovering. Later another soldier, who suffered a blow to the head, arrived at the hospital in light condition. 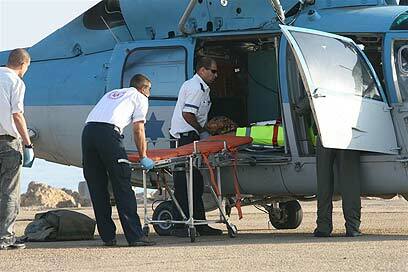 Two more choppers transported six civilians, mainly Turks who suffered from gunshot injures, to Rambam. A senior trauma ward physician, Dr. Eran Talor, said the six were in moderate to serious condition. "They are undergoing tests in the trauma ward as well as other tests, at the end of which it will be decided whether to transfer them to the operating room," he said. Hospital sources said it was flooded with phone calls from international bodies, including the United States Embassy and other foreign delegations, asking about the conditions of the injured. See all talkbacks "Hospitals treat 42 people injured in Gaza sail raid"